It's difficult to move these days without hearing that “content marketing” is the future of marketing. If not the present or even the past. It's somewhat trickier to pin down exactly what content marketing actually is. The problem with most definitions of content marketing is that they confuse and blur rather than clarify. They talk about how content marketing is all about “creating and distributing valuable and relevant information” as if somehow in the past all you needed to do was send useless irrelevant information to customers and they'd bite your hands off to buy your products. Creating valuable, interesting material that your customers and potential customers want to receive is good marketing. It's not specific to content marketing. The real difference between content marketing and other forms of marketing is that the value of content marketing is in information and education. That's why you pay attention to a content marketing piece. Whereas the value of more traditional forms of marketing is usually in the entertainment they provide. You watch TV ads because they're funny or intriguing. You look at the ads in fashion magazines because they're interesting pictures of fashion, just like much of the rest of the content of the magazine. Looked at in that light we can see that content marketing has been around for as long as we've been marketing. 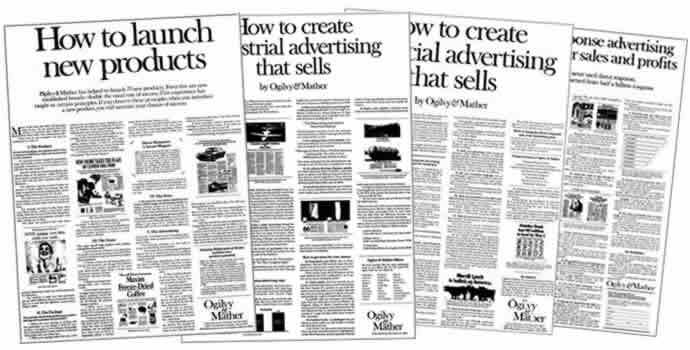 Think back to David Ogilvy's wonderful “House Ads” in the 60s and 70s for example: full page in-depth guides to launching products or writing adverts that displayed his agency's expertise and got the phones ringing with requests for more information. Or the magalogs inside Sunday supplements that educated you on current trends in investing before offering a subscription to their magazines. Or the “Perspectives” articles Bruce Henderson started mailing to potential clients in 1964 to open their eyes to new ideas in strategy and which had established the Boston Consulting Group as the leading Strategy Consultants in the US within a decade. The difference today is simply in emphasis. The dominant media historically have been entertainment focused and so most adverts tended to follow suit. Today, customers surfing the web are looking just as much for information and education as they are for entertainment, so marketing has mirrored this with increasing amounts of information and education being provided to attract and build a relationship with potential customers. And, of course, the truth is that great entertainment-based marketing also includes elements of education (otherwise customers won't know enough about the product to buy) and great education-based marketing also includes elements of entertainment (otherwise customers won't be interested enough to hear the message). Definitions of content marketing also often mistakenly claim that content marketing “isn't about selling, it's about providing valuable information so that customers ultimately reward us with their business and their loyalty”. Again, there's confusion here between “selling”, which is simply the exchange of money for goods and “crass, pushy selling”. If the goal of content marketing is to get customers to buy then it absolutely is about selling. It's just doing it in a different way. The crucial difference is actually timing. With any marketing you can either aim to get a customer to take action now (traditionally known as direct response advertising) or you can aim to make an impression on the customer so that they take action later (when they're browsing the supermarket aisles, or when they need a new car for example. This is traditionally known as image or brand advertising). By pigeonholing content marketing as only being about customers taking action later (by rewarding you with their business in exchange for all the great information you've given them), content marketers are missing out on the huge opportunities of using valuable content to get customers to take action now. And far too many content marketers seem to take a “build it and they will come” approach. They assume that if they produce great content then eventually buyers will reward them for it. But that approach is as erroneous as brand marketers thinking that if they produce a highly creative and entertaining advert then customers will reward them by eventually buying the product. Customers don't buy things to reward you. They buy things because they believe they have a need, and they believe that your product or service is the best one to meet that need. If your marketing, be it information or entertainment based, isn't working on those beliefs about need and about how well your product meets the need, then customers simply aren't going to buy it. Firstly, the real difference between content marketing and other forms isn't some fuzzy notion about value – that's what differentiates good marketing from bad marketing. The difference is that content marketing aims to provide value primarily through information and education, other forms of marketing provide their value primarily through entertainment. Secondly, content marketing absolutely is about selling. If it wasn't it would just be content, not content marketing. That sale can either be in the future: in which case the focus of your content will often be about shedding light on the problem or opportunity your potential customer has and educating them on that. And then building credibility and trust through your content so that you're the natural choice when they're ready to buy. Or it could be in the present: in which case the focus of your content will be more about how your product solves the problem or enables the opportunity your potential customer now knows they have. To overlook either of these timeframes is short-sighted and will lose you business. Now don't get me wrong: content marketing of one sort or another is at the core of how I run my business. And I'll be writing further in the next few weeks on the content marketing strategies that actually work to win you clients. But please, let's not play the “content marketing good, other marketing bad” game by having such a fluffy definition of content marketing that all good marketing fits within it. Let's be clear about what content marketing really is. Let's realise it's been around for a long, long time, and that it can be bad as well as good. Now let's figure out how to do good content marketing, rather than just assuming that all content marketing is somehow good. Next: Content Marketing: What Should I Write About?